Here is a little update on the progress of the new site and shirt releases, just in case your wondering like ffeetuki below. All of our new shirts are ready and we are in the progress of the photo shoot for the new site. That means that we are very close to unavailing some new designs and a brand new site. If you were signed up for the newsletter you would know this already! So SIGN UP HERE! We have also just created a FFee Facebook page which you can check out by clicking the link to your left. We encourage comments so please feel free to say whatever you want: A funny story, your favorite cup of coffee, why you like drawing, whatever it is just go ahead. There will be added benefits to those in our facebook. 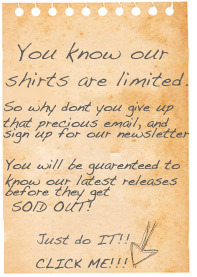 For example, just in our avatar image there are a couple of the upcoming shirt releases that have not been released yet, so just like our newsletter SIGN UP!